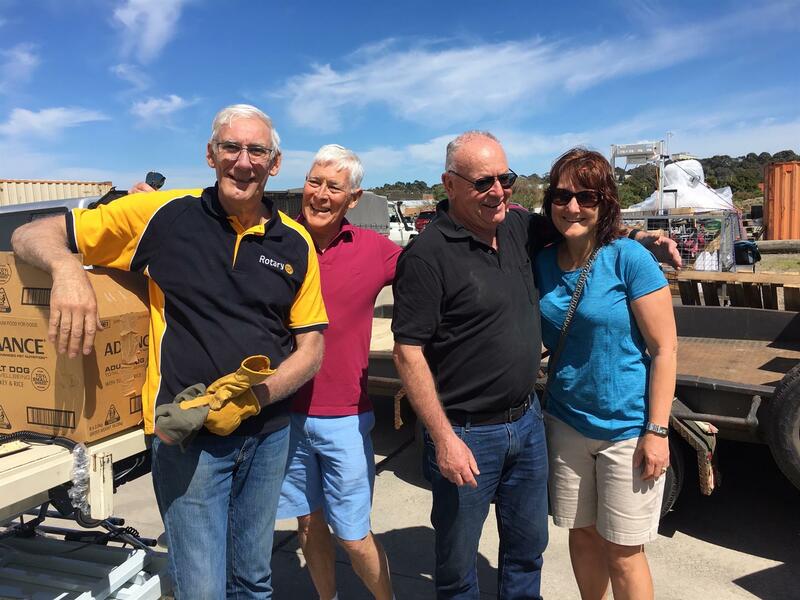 Four Rotary Clubs combined to sort and load the cargo into three containers destined to help the poor in the third world. 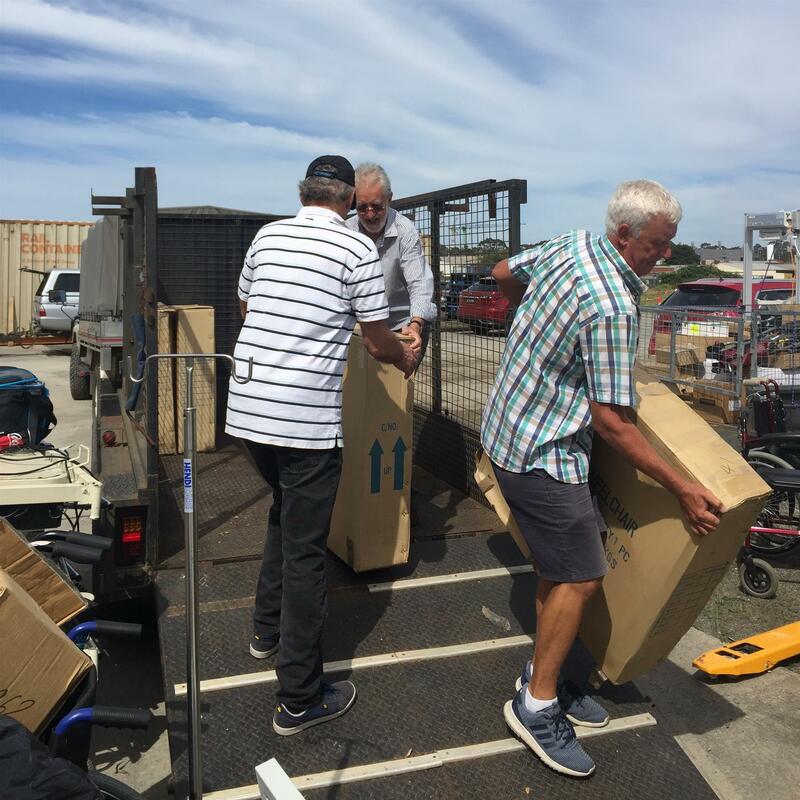 At 9.00 am on Friday 20th October we teamed up with the Rotary Clubs of Belgrave, Ringwood and Wandin at Clayton to pack a container of goods (mainly medical) destined for Cambodia. The history of the container is complex, but in a nutshell we have bought it (and contents) from RC Belgrave, after it had been declared seaworthy. After a briefing from Belgrave’s Wayne McKenzie, we emptied out three containers, and sorted the goods according to their destinations: Cambodia, Fiji and elsewhere. 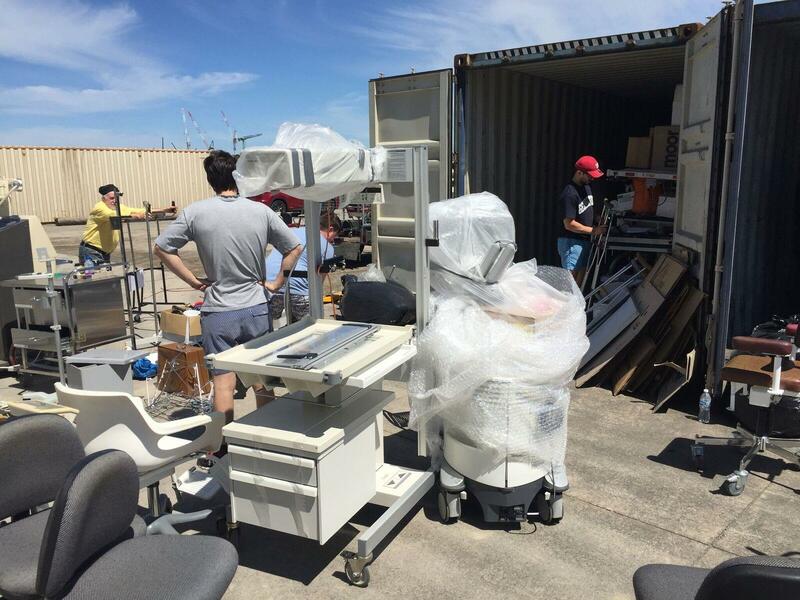 Wayne proved to be an expert at stacking, as we started re-loading the containers: first the heavy stuff: hospital beds. There were 80 metal bed frames that easily stood on end, and ten large electrically powered beds already stacked on top of each other. Fortunately most of the latter were safely in place, and did not need to be re-loaded. Bed heads and ends were squeezed in wherever they could fit: as we pay transport per cubic foot, spare space is a waste. Russell Hayes (RC Wandin) of “Wheelchairs for Kids” had a couple of trailer-loads of wheelchairs to be added, and there were several boxes of “Days for Girls” goods added, before the upper space was filled with bags of hospital linen and of course several matresses for the beds. 25 new Wheelchairs for Kids children’s wheelchairs in cartons for two disability centres. 200 new Days for Girls kits within ten cartons for AusCam in Phnom Penh (which is an NGO established by an Australian woman for prevention of female child trafficking in Cambodia). What else? Better ask Peter Lugg, who was kept busy with pen and paper keeping track of the goods as they were loaded. An X-Ray machine, an operating theatre table, an ultrasound, BP and data trolleys, examination couches, and some mysterious boxes of technical equipment, Peter logged it all. By 2.00 pm the work was over, and our container locked up. It will be sent to the Donations-in-Kind Warehouse in West Footscray for final topping up, and then to the Khmer-Soviet Friendship Hospital in Phnom Penh, where Peter will meet it and supervise distribution of the goods. The cost of our project is around $6,000, and the benefit to Cambodia is approximately $200,000 of goods. Special thanks to Wayne McKenzie of Belgrave RC for organising the container, workers and goods, and especially the refreshments that kept us going on a warm day. Thanks also to David Rush’s International Committee volunteers for all the heavy lifting. (or rather their clever footwork that ensured the younger members of Belgrave and Wandin RCs got an opportunity to show their prowess) From Hawthorn: President Ian Bentley, David Rush, Katrina Flinn and Mick Tyrrell, John Perry, David Pisterman, Peter Lugg and myself.